The historic downtown is worth checking out. There's loads of shops that daytrippers dig. I stopped in none of them because I smelled of athletic endeavors. I figured it was wiser to not ruin sightseers day with my funkiness. Oh, and in case you didn't know, Glen Rose is famous for its prehistoric past. Last Saturday, I woke up at 3:30 a.m. so I could drive down to Glen Rose and start a nine-hour ride at approximately the same time The Texas Time Trial 12-hour ride will begin Sept. 29. First, since it's the country, 6 a.m. is incredibly dark, much darker than Dallas with all the light pollution. Second, it was a very hot day. Third, despite the lack of sleep and the 90-degree temps, I felt really good and increased my comfort with the course (I don't handle steep descents well, y'all). I rode the first loop slowly. Including stops to take pictures and admire the views, it took about two hours. 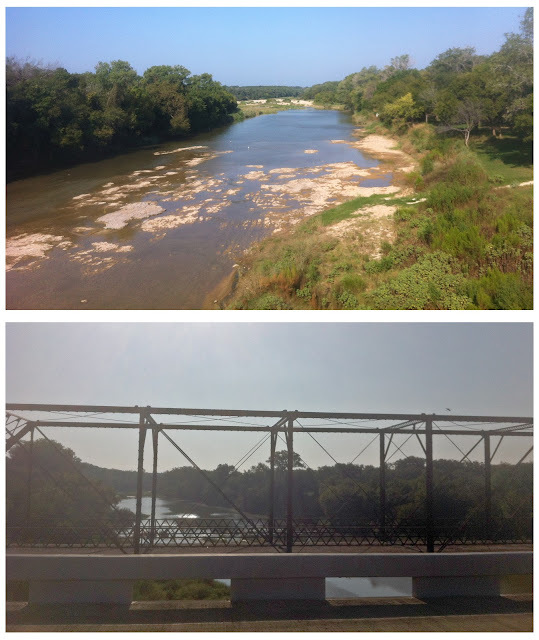 The TTTT loop crosses the Brazos River twice. Having lived in Waco for a short spell, the Brazos and I are old friends. I used to run along its banks near Cameron Park. This beautiful footbridge is at the second crossing and, as you can see by the river's water level, Texas is still very much recovering from a drought. Because I have it on good authority that you never know what your body will crave during a long ride, I picked up Fritos for fuel. I still love my tortillas (averaging half a tortilla per hour) but the saltiness of these corn chips was an awesome treat after my second lap, which took about 80 minutes. Oh, and sunblock! No, I didn't drink it! But I did a good job of reapplying this crap last weekend. No sunburn for this blanco boy! As I pedaled into my third lap, I felt pretty darn good — strong, steady and confident climber and fairly comfy with the descents. But I knew the heat was increasing quickly. Halfway through the third lap, I decided I didn't want to suffer out there, especially alone, as the other riders training were thinning out. I wanted to end my ride feeling great. So I called it a day after 78 miles and less than six hours — three hours shy of my training goal. Although I know I could have met my goal last Saturday, I'm content with my decision. I am confident as TTTT approaches. And even though I never pushed myself on the TTTT course, I now know the loop very well and have a strong idea of how many miles I can ride in 12 hours. And that's an incredible advantage to have entering a race. Nemo. Good ole Homer, he knew how to tell a story now, didn't he? Strong work riding for so long in the intense heat! And smart move trying different nutrition. You just never know what you'll want. And you can't go wrong with salt!